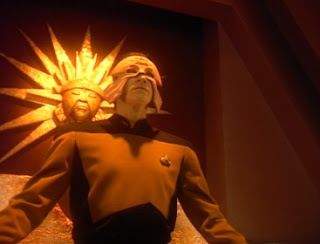 The Angriest: Star Trek: The Next Generation: "Masks"
Star Trek: The Next Generation: "Masks"
It is 21 February 1994, and time for another episode of Star Trek: The Next Generation. The Enterprise encounters an ancient temple in space, hidden beneath the surface of a comet. After an attempt to scan the temple, Data (Brent Spiner) begins to suffer the effects of external manipulation: he becomes increasingly obsessed with unusual sigils and begins to develop multiple personalities. As the Enterprise itself is gradually transformed by the temple's power, Captain Picard (Patrick Stewart) must play out ancient history in order to save his ship and crew. "Masks" really is one of those episodes where you feel compelled to applaud the production team for their adventurous outlook, but you cannot actually praise the end result. It's a somewhat silly, and certainly very uneven hour of Star Trek. The ideas are there, and they're potentially great ones, but the execution stumbles badly. The concept asks a hell of a lot, both of the writers and designers, and of poor Brent Spiner - who has to develop multiple distinct characters based in a fictional mythology using just his acting skills alone. That's a big ask of any actor, but on the insane eight-day turnaround of your average Next Generation it seems particular unfair. That's before you consider that Spiner single-handedly starred in the previous episode as well. He does manage to create several different characters, but he essentially does so by making them as subtle as a cartoon. Writer Joe Menosky also wrote the superb Season 5 episode "Darmok", and while that episode was a wonderful exploration of an alien culture "Masks" simply fails to achieve an equivalent effect. We never get a proper sense of the aliens that left behind the temple, and instead have to stumble through a maze of random names without any proper context. "Darmok" fans will still recite quotes about "Shaka, when the walls fell", but you never hear Star Trek enthusiasts mentioning Masaka or Ihat in the same way. Then there's the problem of section of the Enterprise randomly transforming into a stone temple. No one is killed. There's not one critical system destroyed, and not one random loss of air pressure when a bit of the Enterprise hull turns into a window or something. It beggars belief, and while it might suffice as a high concept, it certainly does not wash as a practical one. There is also nothing learned. The Enterprise encounters this undiscovered alien artefact, and Picard bluffs his way through the climax to get his ship back, but there is nothing to be achieved or gained beyond that. Compare that to "The Inner Light", where Picard's entire experience is to educate him about a long-dead civilization. By contrast "Masks" feels oddly hollow. It is dreadfully under-written. 17 episodes into Season 7, and only nine have actually been that good. It's a shame that "Masks" was not able to be the 10th. The quality ratio slips back to 53 per cent. Highlander: The Series: "The Gathering"
Star Trek: Voyager: "Non Sequitur"